Q: I have always wanted to open an ice cream shop. I’m at a crossroads in my career, and now is the time. There is a perfect rental space in my neighborhood, an area severely lacking a place to go for ice cream, and right next door to ball fields and a playground. How in the world do I get started? I don’t even know how to compile a budget for opening costs to know if it is feasible for us, as I can’t seem to fathom all the variables. Legal, permits, construction, equipment, insurance, etc. Is there a good resource out there that will provide an outline or blueprint that may be helpful? A: Wow! It seems like a great location to open an ice cream shop. Baseball fields and a playground near by provide a great target audience. If you are too unsure about opening a shop right away, you could always have an ice cream vending cart and wheel it over to the children around you. However, I know that opening this shop has been your dream so you are not likely to settle for street vending. kind of permits they require. The website will also inform you on what steps to take in obtaining these permits. You can also visit your local town hall to discover what permits they need you to have. When planning your budget and start up costs, we know of an ice cream business plan template that can be quite helpful. They provide you with an industry analysis and industry averages to give you a better idea of where you stand. You can then take this business plan to the bank and get a start up loan if you so choose. 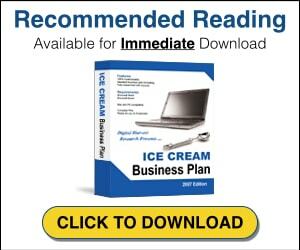 Take a look at Ice Cream Business Plan. It is a great blue print for opening an ice cream shop and includes some incredible bonuses. There are two other things we highly recommend to those considering taking the leap into the ice cream business. One is to interview ice cream shop owners (outside your target area of course) and see what they encountered when they started their businesses. You will learn a ton! Also, read everything you can get your hands on. We have some great selections in our bookstore that give background on the business and can give you plenty of insight. You’re talking about a big step. Research it well and take your time. If possible see if you can work in an ice cream shop, again outside your target market.The experience will be an eye opener. Contact an some ice cream franchises. Starting your own ice cream business can be extremely rewarding and I wish you the best of luck in all of your endeavors.